so wir reuig zu dir zurückkehren. 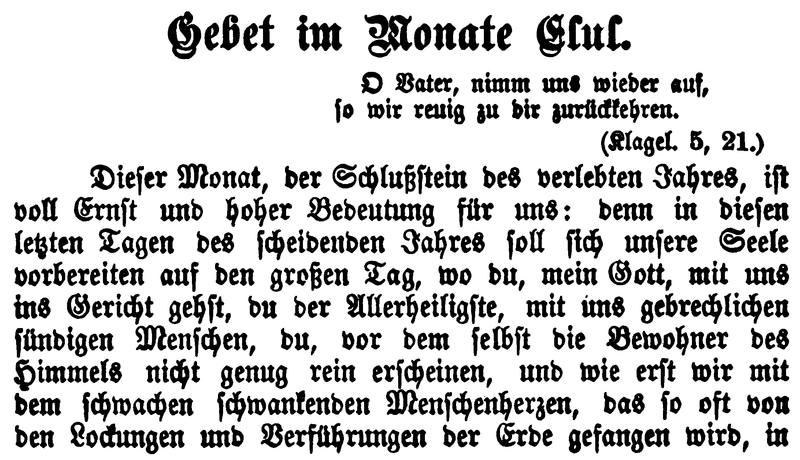 Dieser Monat, der Schlußstein des verlebten Jahres, ist voll Ernst und hoher Bedeutung für uns: denn in diesen letzten Tagen des scheidenden Jahres soll sich unsere Seele vorbereiten auf den großen Tag, wo du, mein Gott, mit uns ins Gericht gehst, du, der Allerheiligste, mit uns gebrechlichen sündigen Menschen, du, vor dem selbst die Bewohner des Himmels nicht genug rein erscheinen, und wie erst wir mit dem schwachen schwankenden Menschenherzen, das so oft von den Lockungen und Verführungen der Erde gefangen wird, in das durch Auge und Ohr die Sünde einzieht und immer heimischer darin wird, und das so oft bald bewußt und bald unbewußt vor dir sich vergehet und deine heiligen Gebote verletzt. This concluding month of the year is full of serious and sublime significance for us: for in these last days of the departing year our souls should prepare themselves for that great day, on which you will sit in judgment over us, you, the Most Holy One, over us frail, sinful human beings, you, before whom even the inhabitants of heaven can not appear sufficiently pure, how much less we with our weak, vacillating heart which is so often led astray by the allurements and temptations of this earth, into which sin enters through our eyes and ears to occupy a lasting abode, and which consciously or unconsciously, often deviates from you and violates your holy laws. Geweihet und geheiligt sind uns diese Tage, wo wir durch unser Bitten und Beten vor dir, Allerbarmer, die Verzeihung und Vergebung unserer Sünden uns erflehen, durch unsere Reue und unsere Thränen die Makel und Flecken der Schuld von uns wegwaschen möchten. Wir wollen zu dir zurückkehren mit wahrem aufrichtigem Herzen, und mit dem festen Willen zur Besserung unseres Thuns und unseres Wandels. Consecrated and sanctified unto us are these days, on which, in our prayers and petitions, we implore your pardon and forgiveness, O All-merciful God! for our sins, on which we are anxious to wash away, by our repentance and tears, the blots and stains of guilt. We long to return unto you with true, sincere hearts, and with the firm resolution to mend our ways and practices. O, heilige du uns diese Tage durch deinen Segen und deine Gnade, Allbarmherziger! daß sie für uns werden Tage der Rückkehr und der Wiederkehr zu dir, o himmlischer Vater, daß sie uns werden Tage der wahrhaften Besserung und Heiligung, wo unser Herz mit verjüngter Liebe der Macht, der Tugend und der Religion sich aufthut, wo der wohlthuende Geist des Glaubens und der Liebe uns einziehet in die Seele, und wir uns, von ihm durchdrungen, von ihm gestärkt und angetrieben fühlen zum Guten und Edeln, zum Kampf und Sieg gegen Schwachheit und Sünde, daß sie uns werden Tage der Erhörung und Gewährung unserer Bitten und Wünsche, und Tage der Verzeihung und Vergebung all unserer Vergehen, Herr, vor dir. Amen. Oh! sanctify unto us these days through your blessings and grace, All-merciful God! grant that they may become for us days of return, and reconciliation with you, Heavenly Father! 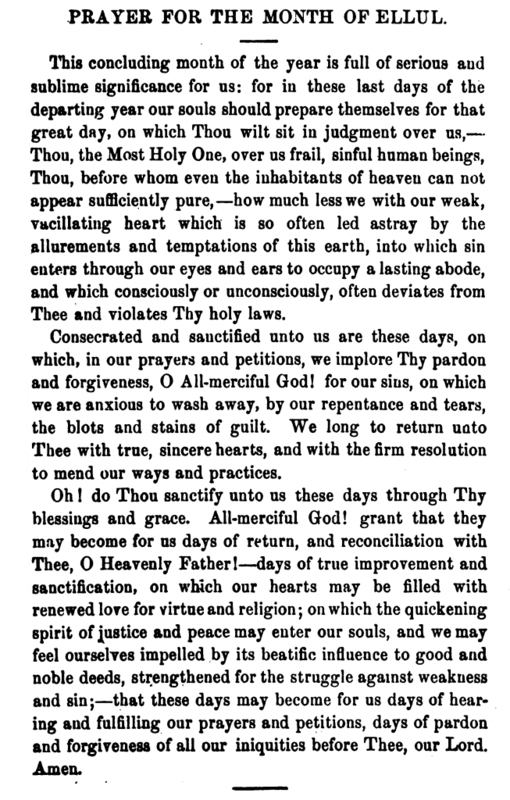 days of true improvement and sanctification, on which our hearts may be filled with renewed love for virtue and religion; on which the quickening spirit of justice and peace may enter our souls, and we may feel ourselves impelled by its beatific influence to good and noble deeds, strengthened for the struggle against weakness and sin; that these days may become for us days of hearing and fulfilling our prayers and petitions, days of pardon and forgiveness of all our iniquities before you, our Lord. Amen. 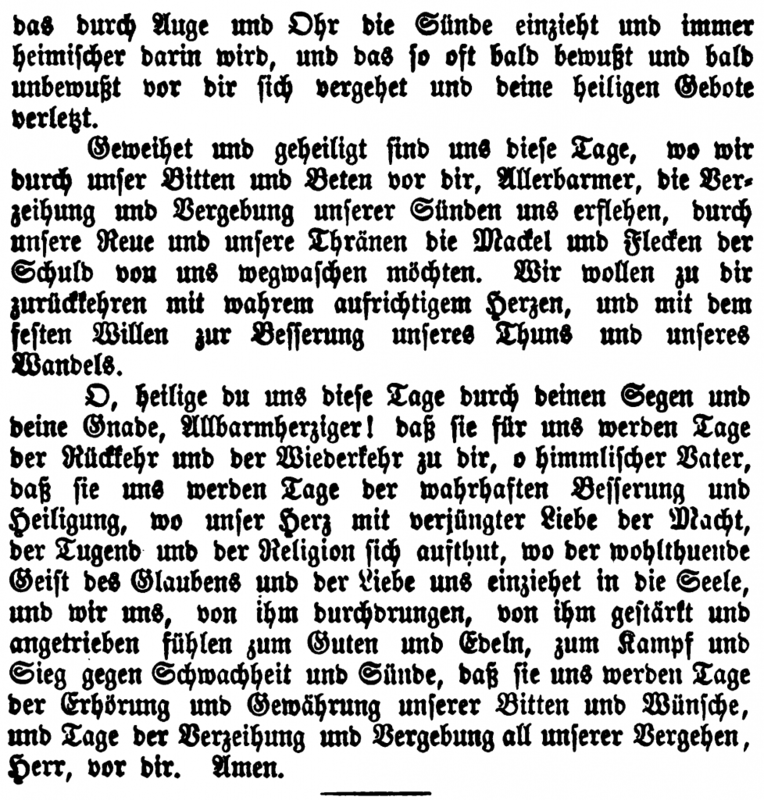 This is the prayer for the month of Elul included by Fanny Schmiedl Neuda in her collection of teḥinot in vernacular German. Fanny Neuda likely either composed or translated this teḥinah into German (from Yiddish) while performing in the capacity of firzogerin (precentress) of the weibershul (women’s gallery) in her husband’s synagogue in Loštice, Bohemia. The English translation provided here was lightly adapted from Rabbi Moritz Mayer’s 1866 translation. Transcription of Stunden der Andacht (second edition, 1858) was begun by Aharon Varady and and proofreading completed on German Wikisource. We invite the community to contribute updated and improved Open Content licensed translations of Neuda’s work. If you would like to, please contact us or include your translation below in the comments. 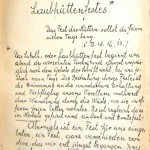 Below are page images from the 1864 edition in Weiberteitsch and the 1905 edition in Fraktur German. 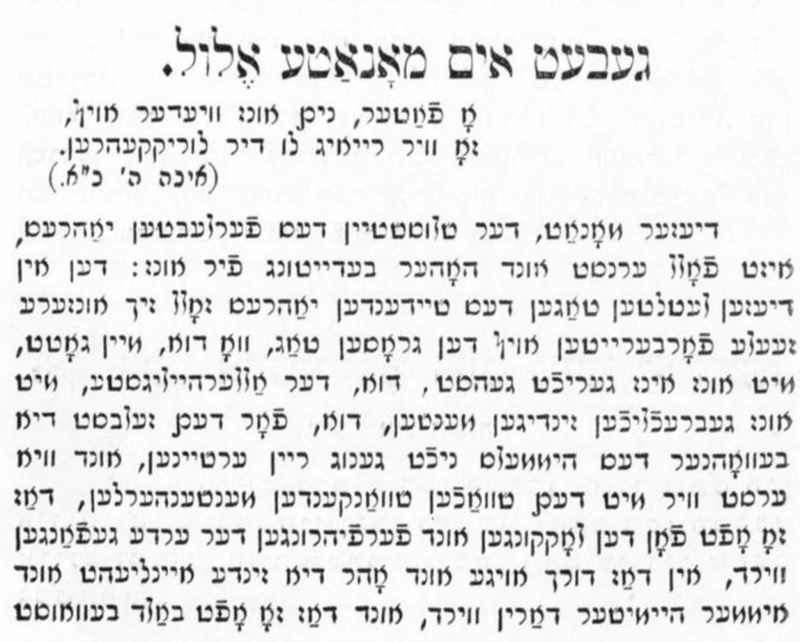 “Gebet im Monate Elul | Prayer for the Month of Elul by Fanny Neuda (1855)” is shared by Aharon N. Varady (transcription) with a Creative Commons Attribution-ShareAlike 4.0 International copyleft license. Fanny Neuda (1819-1894) was a Jewish German-speaking writer best known for her popular collection of prayers, Stunden Der Andacht. 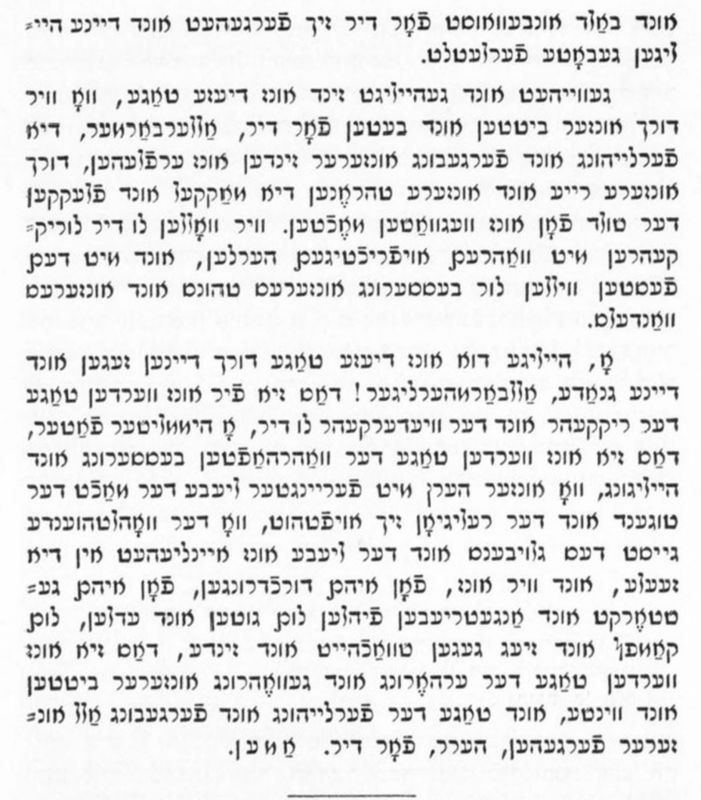 She was born in Lomnice to the family of Rabbi Yehudah Schmiedl (1776-1855). After marrying Abraham Neuda (1812-1854), the couple moved to Loštice to Moravia, where her husband held the position of rabbi. They had three sons: Moritz (1842), Julius (1845) and Gotthold (1846). After her husband's death in 1854 she stayed for some time in Brno and later settled in Vienna . She died at the age of 75 years in the spa town of Merano (present-day Italy). 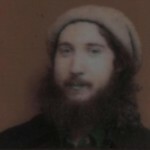 Rabbi Moritz Mayer, born 1821 in Dürckheim-on-the-Haardt, Germany, fled to the United States and to New York as a political refugee of the 1848 revolution. In 1856, after a five year stint as a rabbi in Charleston, South Carolina, he returned in poor health to New York where he contributed frequently to the Jewish press, and translated various German works into English: Rabbi Samuel Adler's catechism, Abraham Geiger's lectures on Jewish history, and Ludwig Philipson's pamphlet, Haben die Juden Jesum Gekreuzigt? (the Crucifixion from the Jewish Point of View), et al. In 1866, he published an english translation of Fanny Neuda's Stunden Der Andacht. The following year, Moritz Mayer passed away. He was 45 years old. Wikisource is a collaborative transcription site and part of the family of user-generated content sites administered by the Wikimedia Foundation. The Open Siddur Project uses Wikisource for collaborative transcription by taking advantage of the Proofread Page MediaWiki extension installed as a feature for public use. For detailed attribution information for any text, please refer to the "View History" link on specific Wikisource pages. Please reciprocate for any adaptation or redistribution of this work by (1) properly attributing the work to Aharon N. Varady (transcription), Fanny Schmiedl-Neuda, Moritz Mayer (translation) and Wikisource Contributors (proofreading), (2) clearly indicating the date you accessed the resource and whether any changes have been made (and if so, please be in touch with us and leave a comment below so that we might note your adaptation or improvement), (3) providing a link back to this source, and (4) specifying the Creative Commons Attribution-ShareAlike (CC BY-SA) 4.0 International copyleft license under which this work was shared.